The shack that I have set up some years ago in front of my garden starring from left to right a Kenwood TL-922 amplifier, a Kenwood TS-570D transceiver, a Daiwa CN-801H SWR-meter and a Dell notebook running the DX4win logger, DSP and propagation software. Hi ! Let me first introduce myself. I am interested in amateur radio since I was a kid, in the '70s. I remember that at school, I read magazines about sciences and new technologies that sometimes published articles about amateur radio activities. Teenager, I read various magazines about ham radio that learnt me all aspects of this amazing activity, the history of wireless, ham-spirit, the first EME transmissions, anecdotes about interferences generated by some installations, the building of aerials and other devices, the intervention of amateurs during disasters, reports of DX-peditions, and more. At the end I realized how well performed radio amateur installations to establish long distance communications. In discovering that I could reach the other side of the Earth by simply switching on my HF transceiver (connected to an antenna ! ), and calling "CQ DX", this simple gesture convinced me to "do radio", to work on the air much better than showing me some big installations or in assisting in a few QSO in Morse code that I didn't understand. I was always surprised and filled with wonder by the speed at which I could reach stations located over 10,000 km away. In a few minutes and with a little luck and the help of a good propagation, I could hear or work amateurs from Africa, Brazil, Australia and Asia ! Face to these performances, the teenager I was considered radio waves as the ideal medium to be instantaneously in contact with people that I could never see. I liked to travel in far countries and this activity offered me, DXing through the air, such an opportunity. I remember that I had my first contact with the amateur radio world in reading science magazines for a general audience. I quickly had the feeling that ham radio should be my first hobby, clear skies to practice astronomy being not numerous in Belgium. 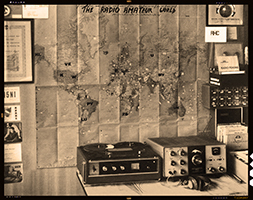 At 18, I remember how excited I was when I asked for and received my shortwave listener (SWL) callsign ONL5183 from UBA, the belgian IARU society; in my mind that meant that I was officially recognized as being member of the huge community of amateur radios, at least as a listener. Rapidely I decided to visit amateur radios to learn more about this exciting activity. In 1978, I visited Jean-Marie Polard, "John", F5VLB (aka ON4EU) who showed me his ham shack starring a Kenwood TS-820 - that I found huge and very complex with my teenager's eyes - and his antennas to work in HF and VHF. 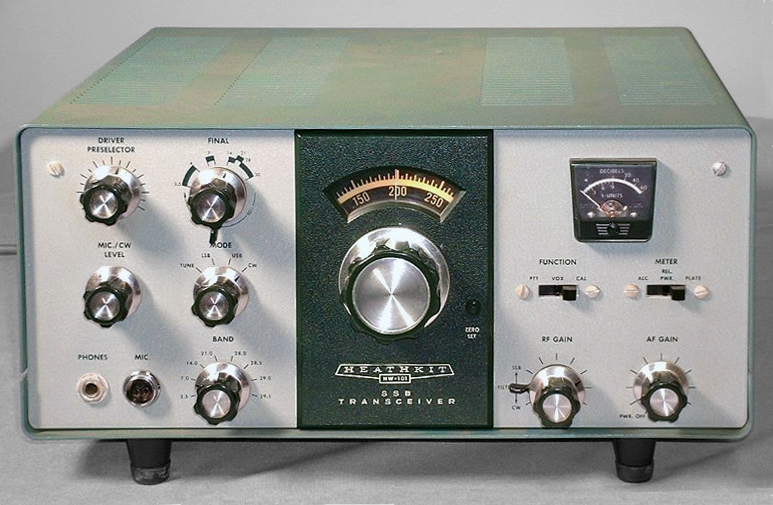 My first ham shack in 1979, when I was still student, starring a Heathkit HW-101 HF transceiver connected to a longwire 20m long, a 1969 Sony taperecorder (stereocorder Solid state 230, cf. YouTube) and already some QSLs and awards ! Then, thanks to the ON5UB East-Brussels Radio Club section that I warmly thanks for their help, I prepared my radio examinations, the theory of radioelectricity and exercising my speed in code to reach 12 wpm. Later I passed successfully my amateur radio examination. Immediately I decided to buy a second-hand Heathkit HW-101 HF transceiver and I tight on the roof a simple longwire antenna 20m long. I rapidely switched on my transceiver and it is then that I discovered the exciting world of amateur radio. I caught the virus for my greatest pleasure ! I remember well how excited I was when I woke up very soon on mornings, sometimes before going to school, to listen to north and south american stations, those of Australia and New Zealand, the shack being flooded with a red light. Probably that some of you received my QSL card as I sent at that time about 10,000 QSLs worldwide. Among the first QSL that I received there was 8Z4A, AB1P, CX4BW, F79WARC, FB8XV, FG0EVT/MM, FO8GC, KL7CT, LU6BBA, N5NI, PT2ZE, U0Y, VE2KD, VK3QB or ZS2MI, for short a large part of the world ! You can imagine how I was excited ! Later, as we can expect, I received back hundreds of QSLs from all over the world but some of them have never been returned for some obscure reason. 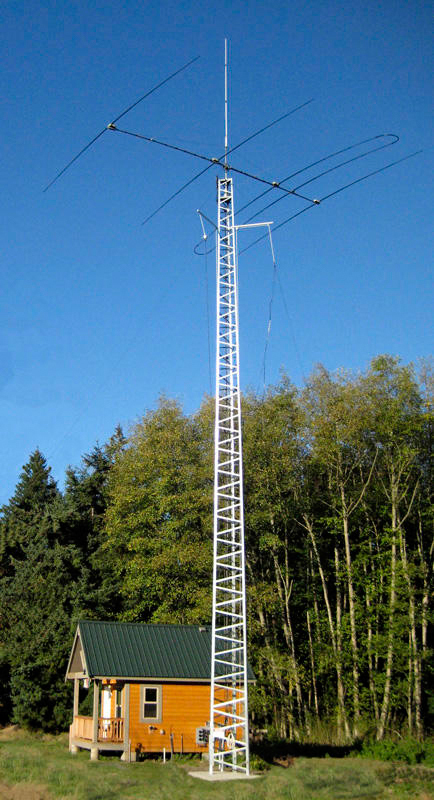 Now, after more than 30 years of amateur radio experience and have weared down some antennas, transceivers and QSLs, I own two callsigns, ON4SKY that I use when visiting Belgium, and LX4SKY that I use from my station in Luxembourg. Of course the "SKY" custom suffix refers to my interest in astronomy. And indeed, with ups and down like in any life, amateur radio became one of my main passions. In fact, I have never let down astronomy, and I am please about that because it has allowed me to better understand the propagation and the impact of the space weather. One day, by chance, while visiting John' shack, I was the witness of a humanitarian action; French hams helped a person in distress in sending her medications. At other occasions, I followed a survival adventure at sea as well as an exploration mission in Arctic conducted by a Belgian team. Today I continue working Antarctic stations, hunting DX stations and from time to time castles, IOTA, maritime mobile, and other shore stations, not to mention DX-peditions and special events. As most amateurs, over all these years I got several tens of awards and thousands of QSLs for all over the world as you will discover in dedicated pages of this site. 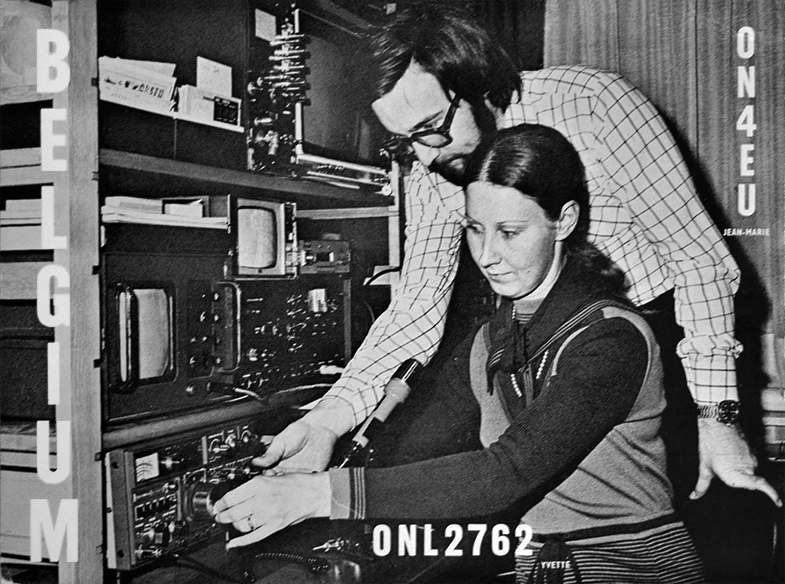 Since my beginnings, the ham communtity became twice more numerous with over 3 millions hams today including 760000 in the sole U.S.A. (2014). At left, a small ham shack but hidden a big gun set up by W7AUM. 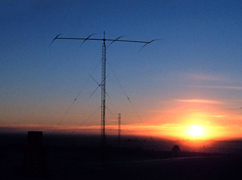 At right, the HF antenna used by NOAA in Antarctica. Document John Bortniak/NOAA Photo Library (ref Corp1627). Parallel to this activity I am very involved in several other hobbies like astronomy for sure, photography and as illustrator as you may see browsing the French pages of this relatively extensive website or the bilingual images gallery published in the Art section. Recently some of my images were even used by NASA and my articles published in QST and other ham magazines for my greatest satisfaction. The good news is that practicing astronomy, I also improve my knowledges in amateur radio propagation. At last, a website like this one, dealing with astronomy and amateur radio should not be complete if I haven't included some pages dealing with radioastronomy and "hams in the sky". A perfect union for a perfect transition, HI ! Even with more than 30 years of practice in my back, and in spite of the fact that I am always happy when I work on the air, remembering of my SWL days, and probably like many licensed as well, sometimes I take pleasure to simply listen to QSOs without taking the mic, and even using a SDR system. But at some occasions, listen to a rare prefix or a YL (a female ham radio), I cannot resist answering to this station, and often just someone calling CQ gets me going ! But of course to work on shortwaves, on HF, as introduced earlier, you need to succeed some examinations and invest in equipment and an antenna. 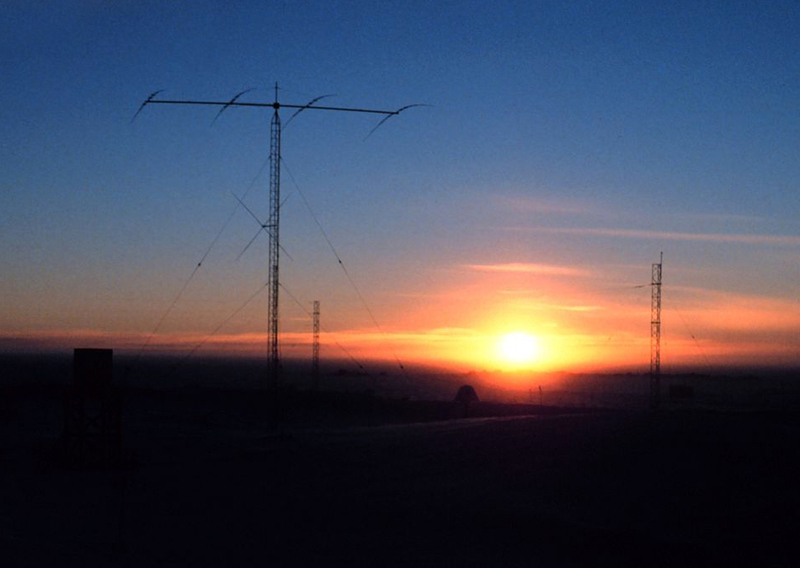 Before discussing amateur radio activities, developing their history, propagation, special modes, DXing, QSLing, equipment reviews, and awards, I would like to explain to novices what conditions are required to access to this activity and become a full privileged amateur radio. In addition, you will find information in my download page that list tens of very useful links (institutions, magazines, hardware, software and more). 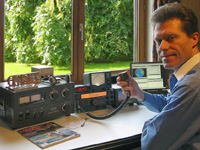 To read : How to become an amateur radio ?